It is funny how blogs and bloggers influence buying and eating decisions, isn’t it? It totally blows my mind when someone tells me that they’ve cooked one of my recipes, or visited a restaurant based on my recommendation. I know that I’m putting everything out here with that intention, but for some reason people’s engagement past comments and Tweets with my site does not really occur to me. 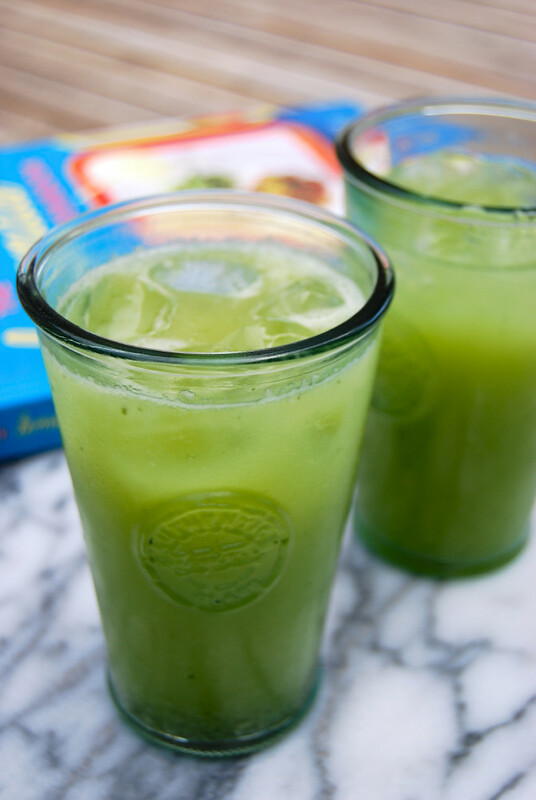 The Lemonade Cookbook has been on my wish list forever, and if I just close my eyes I can picture the outside of Lemonade on Abbot Kinney Boulevard in Venice. However, it was not until someone from my SoCal life, Joy (aka. Joy The Baker) brought and started blogging from it, did I take the plunge. Honestly? It is one of the best new books I’ve had in ages. Before we talk about the book as an actual cookbook, I want to make a note of what it has done for my cooking. Before it arrived, I was actually in a bit of a recipe slump. 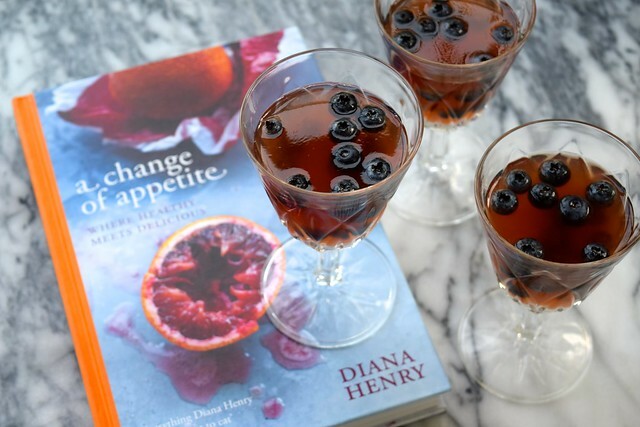 You may have noticed that there have been less recipes than normal around here over the past month, and while a lot of the new and original recipes I have been creating have been going on external projects (sorry! ), I have been feeing in a bit of a funk kitchen creativity-wise. 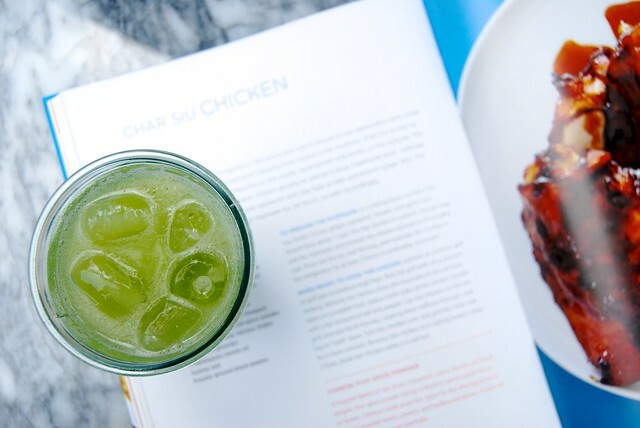 The Lemonade Cookbook reminded me of my Los Angeles kitchen and the food I was creating there (where I think I have been at my most creative since I started blogging), but it also reminded me how much more care into what I ate everyday, but with not much more effort. A by-product of having a fantastic farmers market with massive lemons the size of my palm around the block every Thursday afternoon meant that I always had a large bottle of some sort of homemade lemonade, be it classic, thyme infused or strawberry in my fridge door. I also used to have a jar of some sort of salad dressing made up and ready to go, because I was always so worried about what went into the bottled stuff. For the first time since I made Lavender Vodka Lemonade last Summer I have a vat of lemonade ready to sip (my variation of the books Cucumber & Mint Lemonade is below), and a little jam jar I’ve been working through of the Sesame Vinaigrette in the book made up too. I feel so much more excited about my food again. 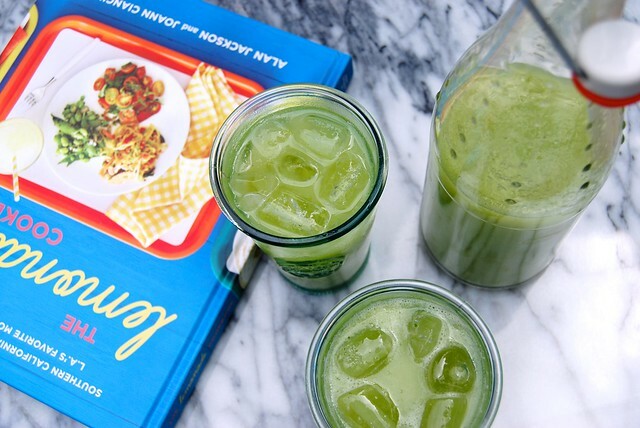 The book is bright, colourful and full of lots of fresh food, as is expected. I’m particularly a fan of how the book is broke into elements. All of the dressings are set aside separately from the salads and made in larger quantities so you can use them on other salads; there are also suggestions for how else they can be had. 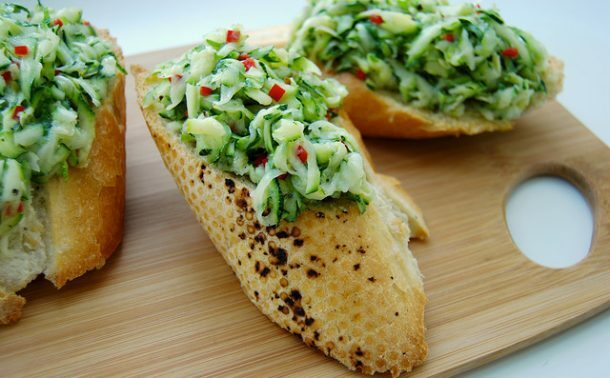 Each recipe has a suggestion of what else from the book, or in general it could be served with, and there is a whole section of mouthwatering sandwiches you can make up with the leftovers from some of the more substantial meat dishes. 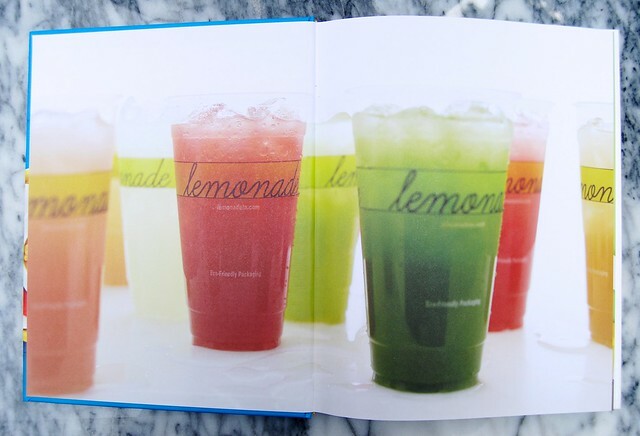 Behind the sweets at the back of the book, all of the lemonade recipes have suggested alcohol pairings to make them a bit more grown up. 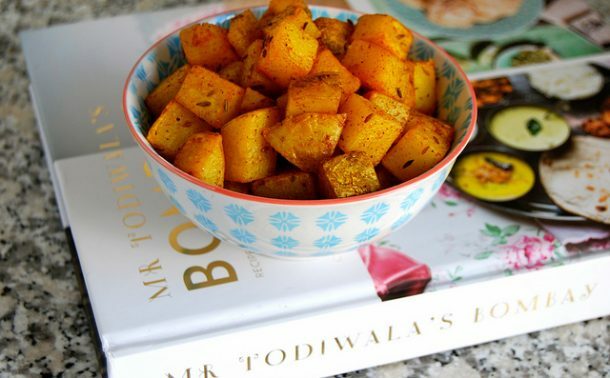 I love how everything so so mix and match, because it makes the dishes so much more practical for everyday cooking; you don’t have to hunt down special ingredients or have masses of leftovers just because you’ve chosen to have one special meal. There is so much from the book I really want to try, such as the Avocado, Cherry Tomato, Pine Nut and Lime Vinaigrette dish, the Buttermilk Baked Chicken and the rich, dense Coconut Cake, but I’ve already made a couple of delicious dishes from the book. Aside from the lemonade below, the genius Sesame Vinaigrette was salad with Edamame and Snap Peas (Soy Beans and Sugar Snap Peas in English), which I also tossed in some pea shoots and switched out the shallot for Spring Onion. Joy also made it her own in a version adding watermelon. I served this alongside Jasmine Rice and the Char Siu Chicken, which was absolutely exemplary. Finally, what about the lemonade? I could happily work my way through all of the different flavours in the back of the book (Old-Fashioned, Blueberry Mint, Cucumber Mint, Cantaloupe Sage, Peach Ginger, Watermelon Rosemary, Pear Basil, Pineapple Coriander, Kiwi Strawberry & Green Apple Jalapeno), and even before I made my first one I knew they were popular; they came well recommended from my UCLA roommate Jenna, and my friend Chelsea from my UCLA Shakespeare class, who made several of them for her wedding. With so many amazing options I settled on the Cucumber Mint, because we have great big posts of mint growing by the back door (we like to make fresh mint tea), and because we have endless cucumbers ready in the greenhouse right now. To make it more manageable I halved the recipe to make one litre, not two, and I halved the amount of sugar listed in the original recipe, but the amount of sugar you use is up to personal preference. I’d recommend adding half, then having a good taste to see if you’d like to add more. 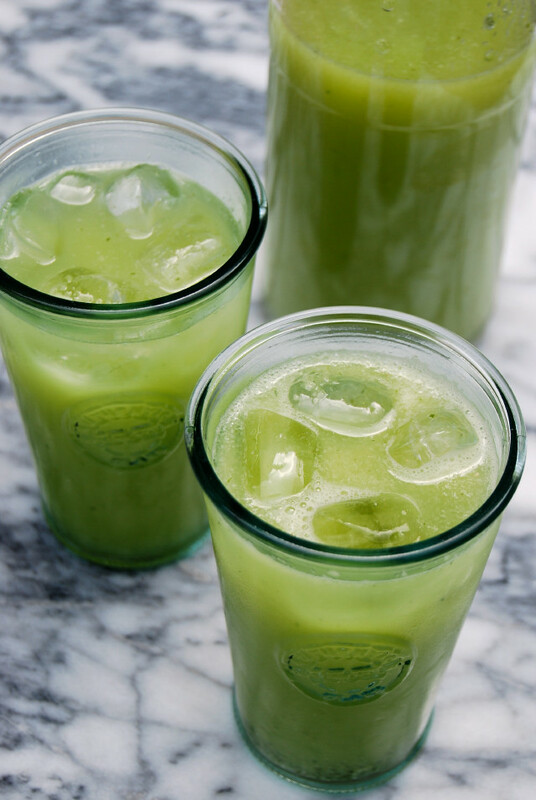 I’ve adapted this delicious, bright green Cucumber & Mint Lemonade from The Lemonade Cookbook to make it fresher and lighter. 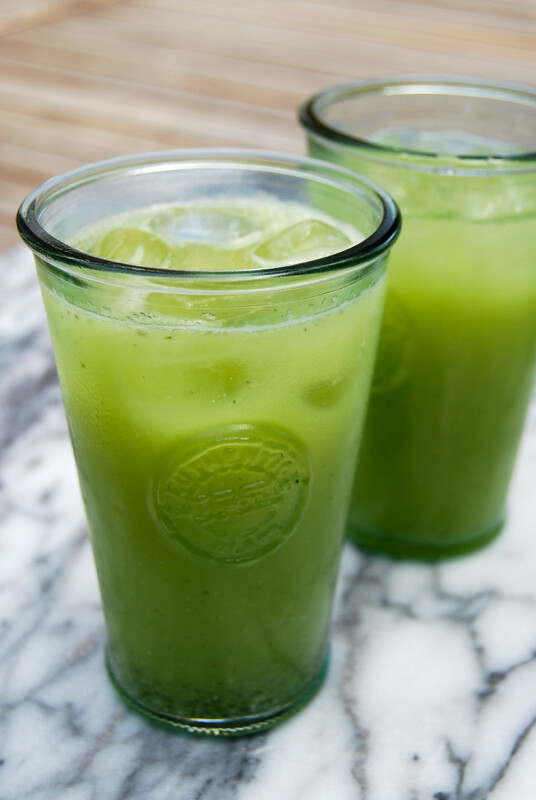 Add the cucumber, mint, lemon juice and sugar to a blender and blitz until very smooth. Depending on the size of your blender, you might have to add the cucumber in two batches to fit, I had to! 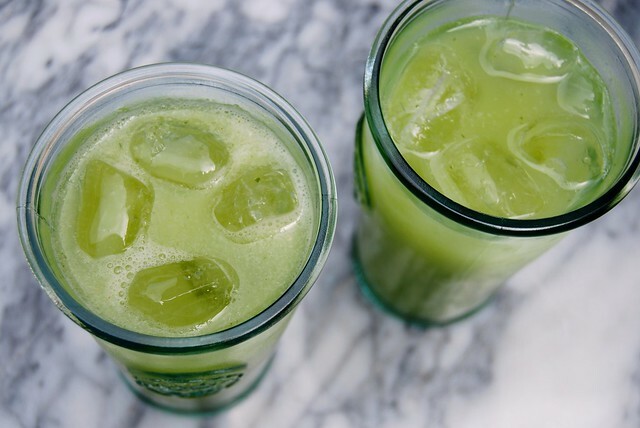 Also, don’t worry about leaving the skin on the cucumber; it does not affect the flavour and helps enhance the lovely green colour of the lemonade. 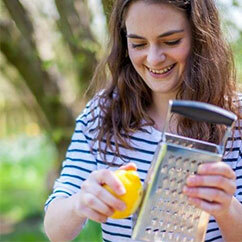 Press the lemonade mix through a very fine mesh sieve over a large jug. You should get a lovely clear green liquid. Add the water in through the sieve, it will make sure not much good flavour is left behind in the pulp, rather than your lemonade. Chill before serving, and serve over ice. 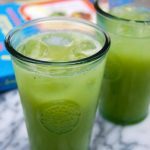 The Lemonade Cookbook is Los Angeles food in 239 pages, and is a must have for anyone who loves sunshine cooking. It was written for the American market (so also keep in mind it is in cups, etc. ), so keep in mind that it is not as cheap as we’re used to being able to get cookbooks online. On Amazon, it will set you back just over £17, but if you like the food on my blog (and I hope you do, as you’re here! ), I know you’ll get a lot of use!